Adam Voges of the Scorchers plays a shot during the win against Adelaide Strikers. ADELAIDE has conceded top spot on the Big Bash League ladder and given reigning champions Perth Scorchers a chance to defend its pennant in a home grand final after a dramatic last-over finish at the WACA on Thursday night. 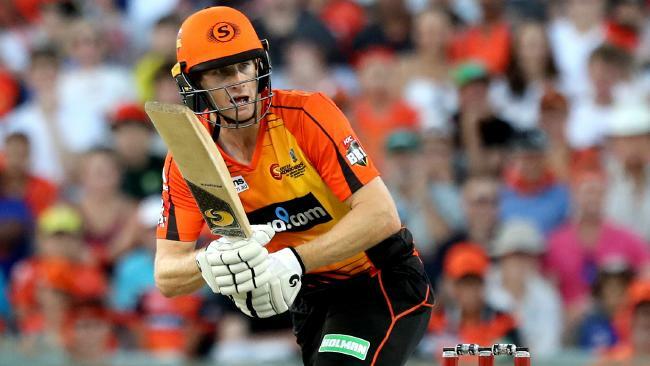 The Strikers had set what had seemed a smallish target of 138 but were still in the game until Scorchers captain Adam Voges put his foot down with a commanding six on the first ball of the home side's last over, from which it had required 10 runs to win. It was all over when Englishman Tim Bresnan guided another ball over the rope on the third ball of the over, making Perth the side to beat again this summer. The Strikers will still have a home semi-final at Adelaide Oval and there are still several scenarios that can play out but it still felt like this match between first and second on the ladder might be a form guide for the final series. The Scorchers had looked like they would romp it in, but the match still had some twists. Rashid Khan, the leg spinner with a peach of a wrong'un, removed Hilton Cartwright and Ashton Turner with consecutive balls and there was still life in the game as the Scorchers struggled to settle. The combination of Billy Stanlake at one end and Khan at the other unsettled the Scorchers until Voges and Cameron Bancroft put on a 77-run partnership that turned out to be the matchwinner in the final match at the venue. The highlight of the Strikers' innings was Jake Weatherald, who extended a rich vein of form this summer with a hand that was both patient at times and explosive at others. 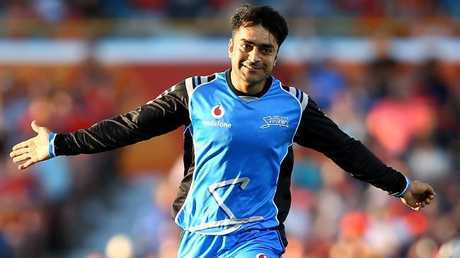 Rashid Khan of the Strikers celebrates the wicket of Ashton Turner. His half century was the glue of Adelaide's innings and included both boundaries and times when he was happy to tick over runs one at a time. Alex Carey, who was shifted down the order, belted 25 runs from 10 balls and was unafraid to strike it over the bowler's head. But there were a few of the Scorchers' bowlers that the Strikers struggled to get a hold off, for various reasons. Ashton Agar, on of the in-form bowlers in the BBL, rarely departed from his tight line, former Test ace Mitchell Johnson (0/17) kept serving up dot balls and then there was Jhye Richardson. Richardson, Matt Kelly and Bresnan took two wickets apiece but it was Richardson who caught the eye with some of the most accurate and regular yorkers that strangled the Strikers when they needed to pick up the pace.